Learn the skills you need to write a novel, short stories or creative non-fiction – biography or memoir. Starts Monday 4 November 2019. Sessions will be held every Monday and Thursday from 6 to 9pm. The final session is on Thursday 28 November 2019. A pre-course module, exercises and preparation material will be available online about a week before the course starts. R7500 – Early bird special of R6750 available now! Payment plan available. If you prefer, you may also pay in three monthly tranches of R2500. Please email us to to arrange. What do you need to write that book you’ve always dreamed of? Our 8-week Creative Writing Course will give you all this and much more. 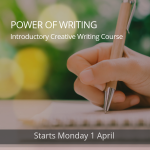 The course, run by Richard Beynon in Johannesburg, is designed to provide you with the skills and tools every writer needs to tell your own story. Allaboutwriting will help you realise your dreams. Also available in Cape Town and online. Sign up for a course that will teach you everything you need to write compelling fiction or creative non-fiction.